Mo Salah has taken some time off before commencing his preparations for the new season. The Liverpool and Egyptian striker recently featured in the FIFA World Cup. After missing his country’s opening game against Uruguay (which they lost 0-1) due to a shoulder injury, he returned to action for the next two fixtures against Russia and Saudi Arabia, scoring on both occasions even as Egypt failed to register a single point. 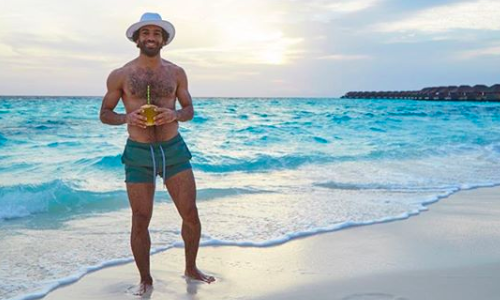 And now, Salah chose to relax on the beach before joining Reds’ pre-season camp. The 26-year-old later took to his official Instagram account to share a few pictures with his 18.4 million followers. Showing off his gym-honed physique wearing just shorts and a hat, he enjoyed coconut water while chilling on the white sand. Salah is expected to jet off to the United States alongside his club mates for their friendly against Borussia Dortmund, to be held in Charlotte on July 22.